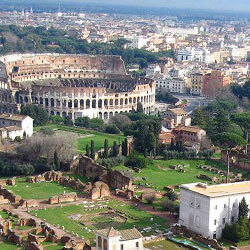 Rome is the capital of Italy, the 2,000-year-old political, spiritual, and cultural heart of the land. It was the centre of the Roman Empire, which shaped Western civilization like no other empire before it or since. It is also the sensuously alluring and romantic city of Fellini's La Dolce Vita, abundantly rich in artistic treasures, including masterpieces by Michelangelo, Raphael, da Vinci, Bernini, Caravaggio, and countless others. Great art is found throughout Rome, including a large concentration of masterworks inside the Vatican City, an independent enclave that is nevertheless an integral part of the city. 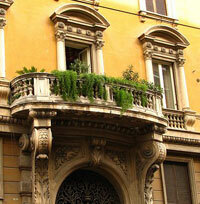 Architectural landmarks of ancient, baroque, and renaissance provenance give Rome a truly unmatchable cityscape. The Pantheon, the Roman Forum, the Colosseum, and the Temple of Saturn are among a few of the ancient monuments that testify to the glory days of the Roman Empire. Other great architectural treasures of the city include St. Peter's Basilica (in the Vatican), Santa Maria Maggiore, San Giovanni in Laterano, the Palazzo Altemps, the Palazzo Massimo alle Terme, and Trevi Fountain. It may surprise you to find that Rome is at close to the same latitude as New York; of course, Rome enjoys a much warmer climate, typical of the Mediterranean coast. Roman summers, which reach a height in August, are often searingly hot. In fact, the city's businesses used to close during August when Romans as a mass would seek out holiday resorts to cool off in; nowadays, with year-round tourism keeping the city busy, more and more attractions and businesses are remaining open all summer. Although Rome can be phenomenally busy, teeming with crowds of tourists and snarled with insane traffic, it is also a city where a slower pace of living is much appreciated. It's the perfect place to while away a leisurely afternoon just having a coffee at an outdoor cafe, or chatting up a friendly local at a piazza, or going for a long evening stroll along the magnificent Tiber River. Rome is divided into 19 sub-municipalities. Once it was 20, but the district of Fiumicino separated from Rome to become an independent municipality. The Vatican City, which has the famous St. Peter's Basilica, the Sistine Chapel, palatial gardens, and museums filled with great masterpieces, may be within Rome, but is considered an independent state.